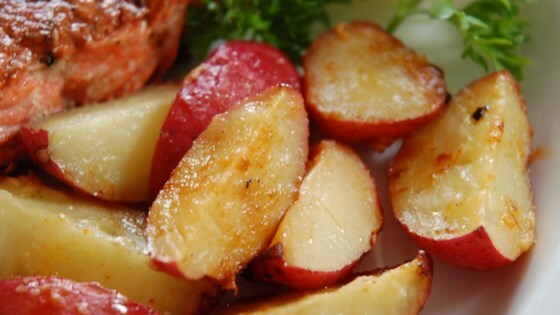 "Simple, savory, and very flavorful variation on new red potatoes. Excellent side dish!" Bake, covered, in preheated oven for 30 minutes. Uncover and bake until golden brown and tender when pierced with a fork, about 10 minutes more. This simple, savory side dish is perfect beside steaks and roasts. Didn't have any lemon on hand, so i skipped that. There was a lack of flavor for my taste. Next time I will use a little more butter and a lot more parmesan! I love roast potatoes, I find that if you par boil first the roasting time is much less and they crisp up better. The cook time for these should actually be about an hour-they are definitely worth the wait! I cooked mine at 400 for about 40 minutes, and they were delicious!